Let us ponder for a moment the wonders of peanut butter, a food staple of American childhood. Who doesn’t occasionally crave the simple pleasures of a sweet-and-salty peanut butter and jelly sandwich? Well, not only is peanut butter good for you, loaded with protein and heart-healthy fats, but it’s also a versatile ingredient that lends itself well to a host of healthy recipes, from peanut butter smoothies to Chinese sesame-peanut noodles. My love for the classic sandwich hasn’t diminished one bit as I’ve gotten older — PB&Js are still regular fixtures in my lunch sack. But now instead of the sugary processed stuff, I use all-natural, unsweetened peanut butter, which is full of flavor, and low-sugar fruit preserves on crusty farm or whole-grain bread. Heaven. I once made these on dinner rolls for a daylong relay trail running race. They’re perfect as a workout fuel, and they’re supertasty to boot. You can also substitute apples for bananas — or use both. Adapted slightly from Shape magazine. Serves one. These noodles make for a simple yet satisfying cold snack or side dish. Adapted from Epicurious, which says the key is not to let the noodles sit in the sauce too long. Puree all ingredients in a blender until smooth and transfer to a large bowl. Toss the noodles with the sauce, top with thinly sliced fresh scallions and cucumbers and serve. Via my colleague Grace Derocha, who uses it for satay dishes. “This makes just over 1 cup usually and I serve it with chicken tenders to dip or I will glaze chicken and grill it and then add it to a salad,” she says. This recipes comes from fellow Healthier Michigan blogger Angela Jenkins, who says they take just 10 minutes to prepare. A serving size is two cookies at 80 calories. Makes 48 servings. In medium bowl, mix the graham cracker crumbs and oatmeal; set aside. In a large saucepan, stir in the sugar, cocoa, milk, and margarine over medium heat until dissolved. Bring the mix to a boil for two minutes — this is important. Remove from heat, and stir in the peanut butter and vanilla until it is well mixed. Blend in the oatmeal mixture quickly. Beat by hand until it is thickened (only a few minutes), if necessary. Using a spoon, drop balls onto waxed paper. Refrigerate or store in another cool place until firm. How do you like to incorporate peanut butter into your food? 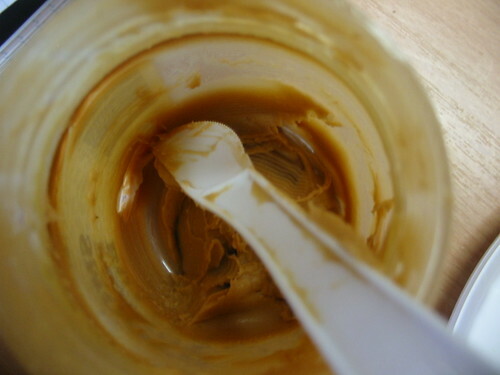 There is only one problem with peanut butter and that is one bite is never enough! I like the noodle dressing recipe listed and am going to give it a try. Thanks! Haha, yes, peanut butter can be addictive. My colleague Grace points out that a serving of peanut butter is 2 tablespoons — so now you know. Thanks for reading and good luck with the noodles!